(House of Blues) Yet another great release from the folks at the House of Blues where blues artists cover the songs of a musical legend. What makes this release so great is that Janis’ songs scream blues. She was one hell of a singer and while the artists on this release don’t match the power that Janis breathed into the originals, they come close. My favorite on this release is Ball and Chain covered by Etta James, one of my favorite female blues singers right behind Big Mama Thorton. 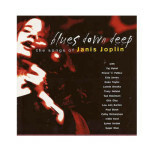 If you’re a blues or Janis fan get this CD now. It is killer.